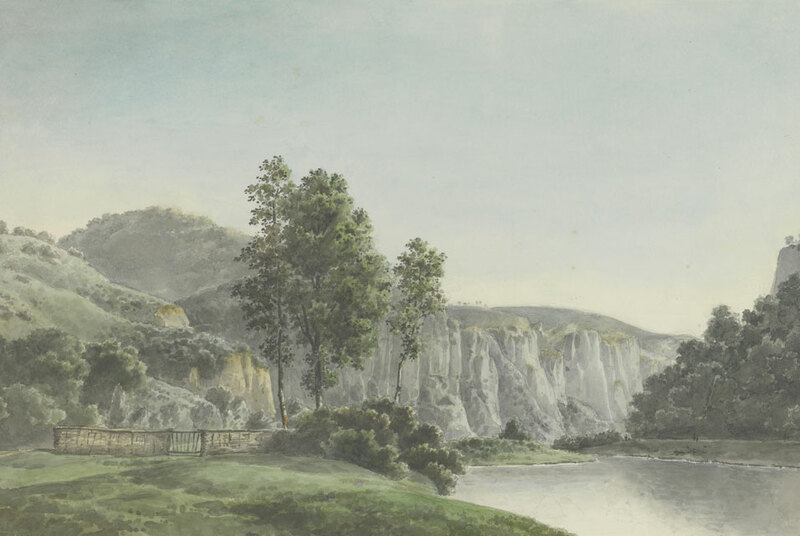 Josephus Augustus Knip, River Landscape with Distant Cliffs, 1809, watercolor over graphite on wove paper with double framing lines in gray ink. NEW HAVEN, CT.- In 1824, the Scottish painter David Wilkie wrote to the director of the French Royal Museums, It is time to show that the arts are cosmopolitan and that all national prejudice is foreign to them. In spite of Wilkies fine sentiment, drawings by British artists from the Romantic period have rarely been considered alongside those produced across the Channel. In response, this ambitious exhibition takes up the challenge of treating Romanticism as an international phenomenon by bringing together nearly two hundred British, French, German, Danish, and Dutch drawings from the outstanding collection of Charles Ryskamp, Director Emeritus of the Morgan Library & Museum and Frick Collection in New York. Varieties of Romantic Experience: Drawings from the Collection of Charles Ryskamp is the first exhibition of this scope dedicated to Northern European drawings and considers the place of British art in a European milieu. It has been organized by the Yale Center for British Art, which is the exhibitions only North American venue. Varieties of Romantic Experience explores the direct relationship between British and Continental artists during the Romantic period (here defi ned approximately as the period between the French Revolution in 1789 and the revolutions of 1848). Despite the very different circumstances in which artists across Europe were working, and the diverse modes of representation they employed, they shared common concerns and frequently explored similar themes. The exhibition and accompanying catalogue focuses on Romanticisms novel exploration of two worlds in particular: nature and the imagination. More than half the drawings displayed are by leading British artists; the other half are evenly distributed among the northern European schools. Alongside important British works by artists such as J.M.W. Turner, Cornelius Varley, William Blake, and Henry Fuseli, there are drawings by key Continental artists, such as Caspar David Friedrich, Camille Corot, Eugène Delacroix, and Edgar Degas. Perhaps the most innovative feature of the exhibition is the inclusion of Danish Golden Age drawings. Outstanding works by C. W. Eckersberg, Christen Købke and Johan Thomas Lundbye make Varieties of Romantic Experience a truly comprehensive show. This exhibition highlights for the first time the direct connections between artists who worked in an age when art took on a distinctly collaborative aspect, as well as demonstrate the simple affinities in approach between artists who could not have known each other. Above all, it aims to reveal the depth and breadth of work produced in Europe during this period and the varieties of Romantic experience. Charles Ryskamp began collecting works on paper at a young age. His earliest acquisitions in the 1950s were British drawings, an interest that complemented his enthusiasm for English Romantic literature, which he studied at Cambridge and later taught at Princeton University. Once Professor Ryskamp became Director of the Morgan Library & Museum in 1969, his collecting interests broadened to include an array of Continental drawings from the Old Masters to contemporary works. A guiding principle in his collecting was to search out uncommon works by the artists represented, works not typically found in the study rooms of the worlds major museums. This interest led him gradually to acquire one of the finest collections of Danish Golden Age drawings in private hands. Gagosian Presents Major Group Exhibition Celebrating JG Ballard's "Crash"
How Did Chinese Artists Learn and Practice Their Craft?